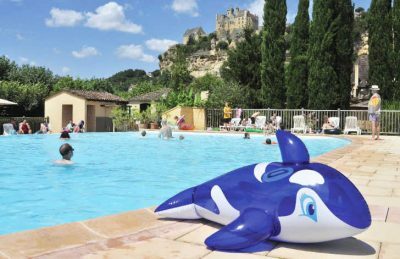 Camping le Capeyrou boasts an unbelievable location on the banks of the river Dordogne beneath the majestic cliff top feudal castle, Chateau de Beynac. The campsite lies within a protected area and is fairly small and intimate, however saying that you’ll be surprised by how much space there is and just how much is on offer. The stunning Chateau can be seen from much of the campsite, however we’d strongly suggest you make the time to walk to the top of the cliff and spend some time walking around the castle. The views of the surrounding area are truly stunning. One thing the Dordogne river is famous for is canoeing and kayaking. There are plenty of places that you can hire kayaks and canoes from in the area but we’d suggest you take a trip up to La Roque-Gageac. Not only is it a wonderful town but you can canoe all the way down past the campsite taking in views of Beynac and Chateau Castelnaud in the process. Unlike many other campsites in the area there is no shop or restaurant on site at Camping le Capeyrou however please don’t fret. There is a shop right across the road from the campsite and you’ll find plenty of lovely traditional restaurants in the nearby area. One of the best things apart from the view and access to the Dordogne river is the campsites swimming pool. A lovely infinity pool and toddlers pool which are heated all year round await you but that’s not the best thing. The best thing about the pool is the view that you have of the chateau from both the water and also the sunbathing area. It truly is spectacular! Camping le Capeyrou campsite isn’t the largest of campsites but you’ll still find a great range of activities and facilities. On site activities at Camping le Capeyrou campsite include table tennis, badminton, volleyball, boules, playground and fishing. Facilities available at Camping le Capeyrou campsite include WIFI, bar, tv room , games room, washers and dryers. Accommodation at Camping le Capeyrou campsite includes safari tents that are available from Eurocamp.